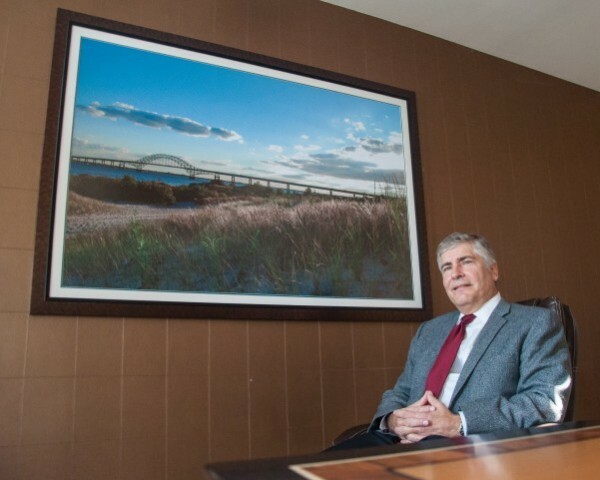 Leonard Bellavia sits in a meeting room at his law practice in Hauppauge, where he had photos of Long Island scenes installed throughout the office. 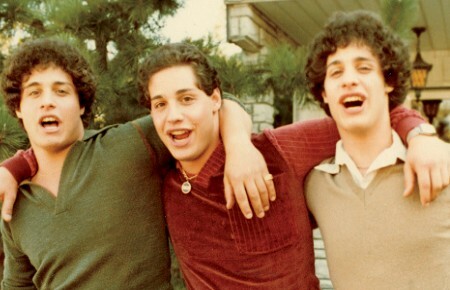 The fact that the Mineola law office of Bellavia, Blatt & Crosset represents clients in the automobile industry is reflected in the photos of vintage cars on its walls. 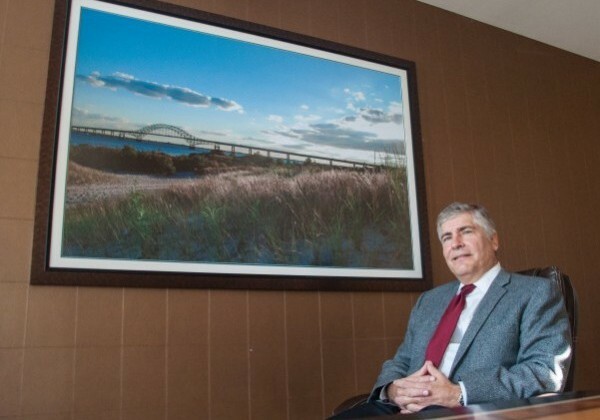 But when senior partner Leonard Bellavia opened a satellite office in Hauppauge last September, he took a more personal approach with the images displayed there. The ten fine art photos that grace the walls at the franchise firm’s fifth office feature several Long Island landmarks and recognizable scenes, including the Montauk Point Lighthouse, Old Hook Windmill in East Hampton, and the North Fork vineyards. With the Hauppauge practice devoted to non-automotive businesses from Long Island, Bellavia wanted his clients to view scenes of the island and to have the images evoke his love of it. 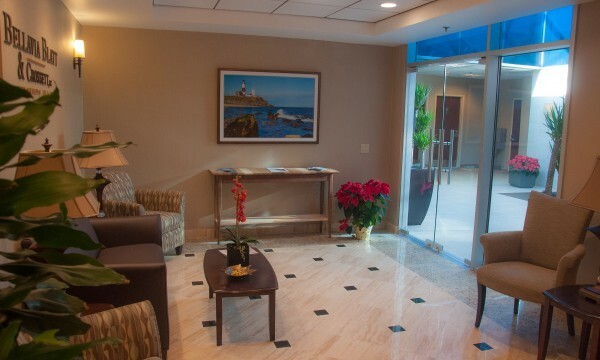 The reception area of the law firm Bellavia, Blatt & Crosset in Hauppauge, where a photo of the Montauk Point Lighthouse hangs near the front doors. When searching for Long Island images, Bellavia’s wife, Susan, visited the Long Island Photo Gallery in Islip, where she viewed hundreds of photos, all captured by local photographers. The gallery’s co-curator, Joanne Henig, helps commercial clients chose the most appropriate photos for their needs; then mats, frames and installs them in their buildings. Most of the images that her gallery sells to commercial buyers are of Long Island, from the Jones Beach bathhouses to the North Shore mansions. 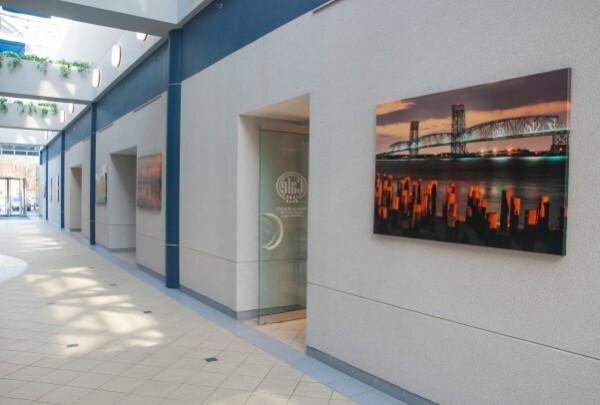 While law firms, CPA offices and the like provide the gallery with a significant volume of work, Henig has also installed photo canvases of diverse images at the VA Medical Center in Northport, Francis S. Gabreski Airport in Westhampton, and Viana Hotel and Spa in Westbury, the last of which features her own photos in all its rooms. She finds that commercial clients also like floral and landscape pieces, often choosing based on the emotions the images evoke rather than according to a theme. 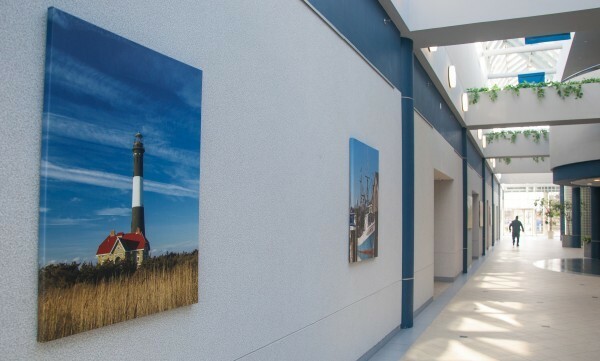 The atrium of an office complex in Melville has 13 photo canvases, including one of the Fire Island Lighthouse. Among the gallery’s larger projects involved a two-story office complex in Melville, with tenants such as East Coast Capital Corp and Senior Service of North America. Henig helped install 13 photo canvases throughout the building’s long, glass-ceiling atrium. Philips International, the realty company that owns and manages the building, hired Maureen Crilly, owner of a Manhattan-based design firm, to reimagine the artwork in the atrium with Long Island-themed images. A major factor she accounts for when redesigning a commercial building are its clients. A photo of the Marine Parkway-Gil Hodges Memorial Bridge is among the photos displayed at an office complex in Melville. The atrium formerly featured a hodgepodge of art that was too small for the scale of building. Scale is another critical factor in Crilly’s approach toward design. She met with Henig at her gallery and had her hang the 40 x 60 inch canvases throughout the atrium. The mostly nautical images include not just landmarks such as the Fire Island Inlet Bridge, but also fisherman, marshes, and sailboats. The clients at the building were initially curious about why the art was being replaced, Crilly recalled, but once the project was completed they responded positively to the many familiar structures and scenes. “If you build up the aesthetics and you build up the charm of the space and that’s the first thing you see, then you’re more likely to say that I’ll rent this office,” Crilly said of the a reason for installing new art. Long Island Photo Gallery of Islip provided the images of local photographers in the redesign of this office building in Melville. 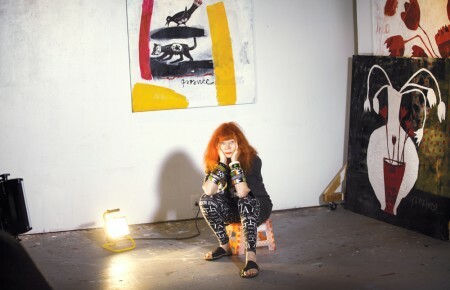 Her firm, Crilly Companies, works mostly with residential clients that often own their own pricey paintings, which she reframes and rearranges. Her commercial clients typically opt for less expensive photographs for their walls. Office art is normally designed to project a company’s character and culture to its clients, prospective clients and employees. She believes there has to be that tie between a company and its art.